Objectives: Kidney transplant is the gold standard for treatment of renal failure. With the increasing age of the recipient population, which carries significant comorbidities, and the use of more marginal organs, there is potential for increased critical care admissions. In this study, we investigated the incidence, indi­cations, and outcomes of patients admitted to critical care within 1 year of transplant. We also aimed to identify any precipitating factors or events that may trigger these admissions, as well as establish variables that could affect mortality. Materials and Methods: We performed a retrospective analysis of kidney transplant recipients admitted to critical care within 1 year after transplant, between January 2009 and December 2013. Results: Of 1002 kidney transplants, 53 patients (5.3%) were admitted to critical care within 1 year, with patients separated into 2 groups. Group 1 comprised 32 patients (61%) who were admitted immediately postoperatively, mainly from cardiorespiratory de­rangements with mean stay of 3.7 days (range, 1-34 days) and 0 mortalities. Group 2 comprised 21 patients (39%) who were admitted later in the postoperative period, principally from sepsis-related complications with a mean stay of 18 days (range, 1-101 days). Most patients in group 2 required intensive therapy, including mechanical ventilation and immunosup­pression reduction, incurring a hospital mortality rate of 48%. Hemorrhage with reexploration was higher in group 1. Diabetes mellitus, cardiac comorbidity, prolonged stay, nutritional support, nosocomial infections, and multiple organ failure were found at a higher rate in the group 2 patients who died. Conclusions: The incidence of critical care admissions 1 year after kidney transplant was 5.3%. Most admis­sions occurred in the early postoperative period, mostly as preemptive measures for cardiorespiratory monitoring and support. This category of admission is potentially preventable with optimization of pre­operative treatment. Later admissions were mostly consequential to sepsis-related complications, with patients having a high mortality rate due to multiple organ failure. Clinical management should therefore focus on the prevention of multiple organ failure to improve patient outcomes. Kidney transplantation is the treatment of choice for most patients with end-stage renal disease and provides the highest survival benefit compared with other modalities of renal replacement therapy.1,2 However, because of the need for postoperative immuno­suppression, patients require close surveil­lance after transplant as they are rendered susceptible to opportunistic and other infections, malignancies, and cardiovascular diseases. In addition, these reci­pients often have multiple comorbidities due to, or as a cause of, their underlying renal pathology. Kidney transplant procedures have evolved into a safe intervention. Therefore, most patients do not need admission to intensive therapy or care units (ICUs) or require critical care postoperatively. The caveat to this is that certain patients with specific premorbid medical problems or those experiencing postoperative complications may require more intensive monitoring. This has become increasingly relevant with increased availability of transplant for older recipients coupled with the use of more marginal grafts. In addition, the incidence and outcomes of kidney transplant recipients requiring critical care management after transplant have remained poorly quantified. In this study, we investigated the incidence, indications, and outcomes of patients admitted to ICU within 1 year of transplant. We also aimed to identify any precipitating factors or events that may trigger critical care admissions in this group of patients, as well as establish variables that could affect mortality. The secondary outcome was to identify how in clinical practice we may intervene to reduce admission rates or avoid poor outcomes following ICU admissions. We conducted a retrospective review of a pro­spectively maintained departmental database and critical care records of all adult kidney transplant recipients admitted to critical care in a large trans­plant center (averaging 250-290 renal transplants annually) between January 2009 and December 2013. Patients with pancreas transplants and pediatric kidney transplant recipients were excluded from the study. Demographic data, type of transplant, time interval between transplant and admission into the ICU, indications for ICU admission and precipitating factors, organ-related support given on critical care, and outcomes in terms of morbidity and mortality were analyzed. Patients were separated into 2 groups to characterize the different indications and possible differences in outcomes. Group 1 comprised immediately postoperative ICU admissions (within 48-72 h), and Group 2 comprised later admissions within 1 year of transplant. The choice of a 48- to 72-hour cutoff period for group 1 patients is to reflect the immediate or postanesthetic phase of recovery from major surgery, a period fraught with car­diorespiratory, anesthetic, and hemodynamic com­plications, when postoperative infections are not yet established. GraphPad Prism software (La Jolla, CA, USA) was used for statistical analyses. We used chi-squared or Fisher exact test for categorical variables and unpaired t tests for continuous variables. The tests were considered statistically significant at P < .05. The selection and preoperative work-up of all kidney transplant recipients was uniform. Elderly and cardio respiratory-challenged patients had been thoroughly investigated and optimized before being placed on transplant wait lists. However, some patients, who may have stayed longer on the wait lists, may have had deterioration of cardiorespiratory status by the time an allograft was ready, making them a higher surgical risk. 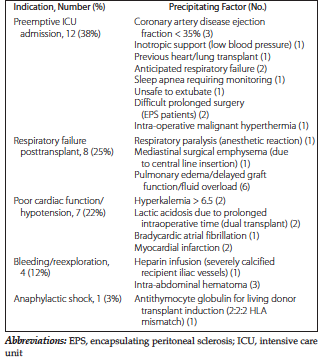 These categories of patients were then designated for preemptive critical care posttransplant, and they constituted a sig­nificant proportion of the early posttransplant ICU admissions. All transplant procedures were performed by the same surgical team, in the same institution with a uniform surgical technique. The initial immunosuppression protocol included an induction agent (basiliximab; Novartis, Basel, Switzerland) with maintenance immunosuppression as per departmental protocol of a calcineurin inhibitor, tacrolimus (Astellas, Tokyo, Japan), an antimetabolite (mycophenolic acid; Novartis, Basel Switzerland), and steroids, which was discontinued after 5 days unless otherwise indicated by higher immunologic risk or burden at clinician discretion. Variations in immunosuppression were considered but only on a case-by-case basis as per protocol and based on immunologic risk or primary renal disease. Anesthesia administration and critical care manage­ment were supervised by a consultant anesthetist or critical care physician in all cases, and depart­mental protocols were adhered to regarding the course of anesthesia and critical care treatment for elective cases. From a total of 1002 kidney transplants performed over the study period, 53 patients were admitted to an ICU (incidence of 5.3%). Male-to-female ratio was 33:20 (62% male); mean age was 51.7 years (range, 24-75 y), and average body mass index was 27.9 kg/m2 (range, 15.0-37.1 kg/m2). 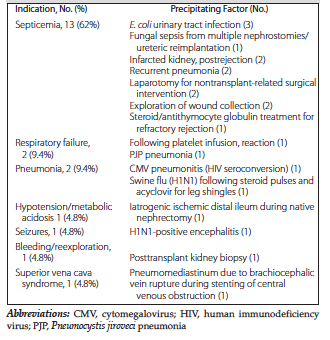 Patient characteristics and transplant variables are further summarized in Table 1. Diabetes mellitus constituted a major primary cause of end-stage renal disease in these patients. Immunoglobulin A nephropathy and reflux neph­ropathy are other significant causes that were noted. It is also noteworthy that patients with congenital anomalies, including spina bifida, which potentially results in complex surgical reconstruction such as ileal conduits, have higher ICU admission rates. About 60% of patients who required ICU admissions were on hemodialysis before transplant for an average duration of 6.7 years. Cytomegalovirus status in either the donor or recipient was positive in 62% of the patient population. Most patients (61%) were admitted to the ICU during the immediate posttransplant period, perhaps reflecting their premorbid status and perioperative factors. 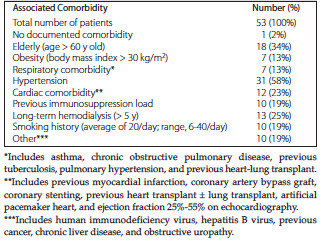 An analysis into associated comorbidities prevalent in this group is outlined in Table 2. Only 1 patient had no associated comorbidities. Because kidney transplant recipients who require ICU admission reveal a bi-modal pattern, we divided patients into 2 categories: Group 1 comprised the immediate postoperative ICU admissions (at 48 to 72 hours posttransplant), and group 2 comprised later ICU admissions within 1 year postoperatively. The indications and precipitating factors for the 2 groups are shown in Tables 3 and 4. 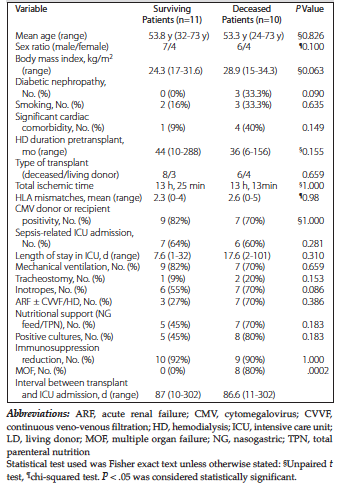 The major reason for elective admission of patients to the ICU in the period immediately after renal transplant was preemptive in patients with cardiac and respiratory impairment (38%). This was followed by acute respiratory failure, pulmonary edema, and cardiac failure/hypotension. Hemorrhage was more common within the early postoperative period, especially with the use of high-dose heparin infusion as prophylactic anticoagulation in patients with atheromatous vasculature. 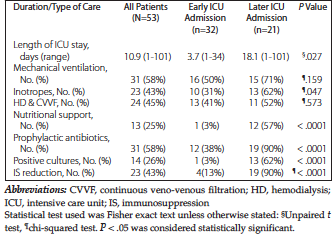 The average ICU stay for those in group 1 was only 3.7 days (range, 1-34), with most patients requiring only cardiac and respiratory monitoring and little or no adjunctive organ support (Table 5). Later admissions were principally due to sepsis (62%), possibly consequent to the immunosup­pressive burden. These patients had a much longer ICU stay, with average of 18 days (range, 1-101 d), and most required significantly more interventions for organ support, including mechanical ventilation, inotropes, hemofiltration/hemodialysis, and nu­tritional support. These patients also had a higher percentage of positive microbial cultures, greater need for prophylactic and therapeutic antibiotics, and required longer periods of immunosuppression reduction. 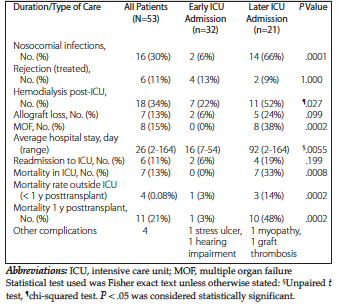 These later ICU admissions were also more susceptible to nosocomial infections and other ICU-related complications, possibly because of their longer stays in ICUs and exposure to more invasive therapies (Table 6). Nosocomial infections noted in the immediate postoperative ICU stays were typical of those seen early after renal transplant and included urinary tract and wound infections. For the later admissions, Cytomegalovirus and bacterial pneumonia, urinary tract infections, and wound sepsis were documented. The positive microbiological cultures included Escherichia coli (35%), fungi (Candida and Aspergillus; 30%), Klebsiella (10%), vancomycin-resistant entero­coccus (10%), other coliforms (5%), swine flu (H1N1 virus; 5%), and Clostridium difficile (5%). All graft losses were transplant nephrectomies due to the following reasons: fungal balls in ob­structed transplant kidney, graft thrombosis, infarcted kidney, and uncontrollable hemorrhage (from inferior vena cava patch-reconstructed short transplant renal vein). Most patient deaths both within and outside the ICUs were sepsis related. An exception was 1 patient in group 2 who died outside the hospital 9 months later from diabetic ketoacidosis. Among the immediate postoperative ICU admission group, there were no mortalities in the ICU. The single mortality in this group occurred at 10 months outside the hospital from sepsis secondary to gangrene of the right foot. Group 2 recorded 7 deaths within the ICU (33%) and 3 deaths outside the ICU on the same admission (inpatient mortality of 48%). The overall 1-year survival of all kidney transplant patients admitted within 1 year of transplant to the ICU was 79% with a graft survival of 66%. This is statistically significant compared with both the 96.5% patient survival of our entire kidney transplant population over the same period (P = .0027; unpaired t test) and our standard 1-year graft survival of 95% (P = .049; unpaired t test). When we compared patient and transplant characteristics and associated comorbidities, length of stay in ICU and care modalities between deceased and survivors within the later ICU admissions, we found no significant variables predictive of mortality (Table 7). Sepsis was an accurate predictor of mortality, as almost all recorded deaths occurred in the presence of sepsis (80%). Variables such as diabetes mellitus, cardiac comorbidity, long ICU stay, need for nutritional support, and positive microbial cultures were remarkably higher in the deceased of the sepsis-related ICU admission subpopulation and tended toward significance. However, only multiple organ failure was statistically significant (P < .05) as a positive predictor of mortality. In our study, we identified a first group of patients (group 1) who made up a significant pro­portion of the patients admitted to the ICU, principally as a preemptive measure for cardiores­piratory monitoring, or following immediate anes­thetic or surgical complications. This group constituted 61% of our study population, with most patients requiring only monitoring with a short ICU stay. Only 6% lost their graft from thrombosis or unsalvageable hemorrhage. Early delayed graft function from acute tubular necrosis required continuous venovenous hemofiltration or hemo­dialysis for a short period. Only 22% remained on hemodialysis after discharge from the ICU (compared with 52% in the sepsis group). None of the patients died in the ICU, with the only death recorded in this group outside the ICU, occurring 10 months later from septic gangrenous right foot. The outcome in this group is a reflection of prompt and effective ICU management of high-risk surgical patients. This pattern of early ICU admissions after kidney transplant has also been corroborated by others.4,13 Sadaghdar and associates demonstrated that history of cardiac disease was the most frequent reason for immediate postoperative ICU admission among kidney transplant recipients, whereas sepsis was the major reason for later ICU admissions. In addition, in line with our findings, they reported a better hospital outcome in the group 1 patients with a low mortality rate of 3.7% (0% in our study) and a short mean ICU stay of 5.1 days (3.7 days in our study). This study is novel in that it also seeks to identify precipitating factors triggering the need for ICU admission. The use of a supranormal “heparin protocol” for a kidney transplant recipient with severely calcified iliac vessels was identified as the trigger for massive hemorrhage that necessitated ICU admission in the immediate perioperative period in one patient. The only recorded later ICU admission from hemorrhage occurred after a transplant kidney biopsy. Sadaghdar and associates did report bleeding after transplanted kidney biopsy.13 Other notable precipitating events included the following: (1) anaphylactic reaction from antithymocyte globulin infusion; (2) respiratory failure from fluid overload; (3) hypotension and cardiac dysfunction from hyperkalemia, myocardial infarction, or lactic acidosis; (4) seizures from encephalopathy; (5) respiratory muscle paralysis from anesthetic reaction; and (6) sepsis from nontransplant surgical procedures, including colonic perforation on exploratory laparotomy. A conscious effort at averting these precipitating events will significantly reduce the rate of ICU admissions among kidney transplant recipients. Later ICU admissions (group 2 patients) constituted 39% of our study population. These admissions were predominantly related to sepsis, had a longer ICU stay (mean 18 d; range, 1-101 d), and included a greater number of patients who required more intensive or invasive care, including mechanical ventilation, renal support, inotropes, nutritional support, and immunosuppression modulation. Their outcomes were poorer with a high rate of nosocomial infections, graft loss, multiple organ failure, and mortality (ICU mortality rate of 33% [7/21] and hospital mortality rate of 48% [10/21]). The total duration of hospitalization was also prolonged, with > 52% still requiring hemo­dialysis after discharge from the ICU. One patient developed hydronephrosis, which was later com­plicated with fungal balls in the kidney allograft that necessitated a transplant nephrectomy. There were relatively many more positive microbiological cultures in this group. In line with our local protocol of severe sepsis management, 90% of this group had their immunosuppression minimized or stopped completely other than a continuation of steroids to prevent an Addisonian crisis. Despite immuno­suppression modulation and use of antimicrobials, 38% of patients deteriorated into multiorgan failure and eventually died. In the total study population of 53 patients, the overall ICU mortality rate was 13% and hospital mortality rate was 21%. These numbers are consistent with an ICU mortality rate of 10% to 16% reported by Sadaghdar and associates13 and also by Kogan and associates14 but differs from higher rates reported elsewhere.3,4,16,17 However, all of these studies concur that sepsis and multiple organ failure are the principal causes of mortality. This study was limited to a single center experience, but the sample size is reasonably robust due to the nature of the case volume at our center. The study is also retrospective, which is a limitation but is difficult to overcome, as admissions to ICU can be difficult to predict. In addition, random allocation to standard or ICU care prospectively would have significant ethical difficulties. 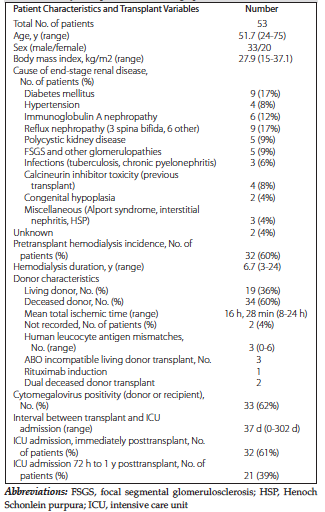 In summary, kidney transplant recipients ad­mitted to ICU facilities after transplant were admitted during the immediate perioperative period mainly as a preemptive measure because of underlying pre­morbid and/or perioperative cardiorespiratory, anesthetic, or early surgical complications or were admitted during the later postoperative period, usually because of sepsis-related complications. Indications for ICU admission can be traced to a specific precipitating factor or event. Intensive care unit admissions from bleeding occur more in the immediate posttransplant period. Whereas patients admitted in the immediate postoperative period usually have a shorter ICU stay, the latter group has a relatively longer stay, requiring more intensive and invasive ICU care and consequently are more susceptible to ICU-related complications. Mortality is therefore significantly higher for latter ICU admissions and is predominantly related to sepsis. Certain patient variables including diabetes mellitus, cardiac comorbidity, prolonged ICU stay, need for nutritional support, positive cultures, and multi­organ failure were found to be higher in deceased patients of the sepsis ICU admission subpopulation but only multiple organ failure was statistically significant as a positive predictor of mortality. There is currently an increased potential for ICU admission after kidney transplant due to more marginal allografts and more significant medical burden in potential recipients. However, the rate of ICU admissions can be significantly reduced by targeting the early and immediate posttransplant admissions especially for patients requiring pre­emptive care. This can be achieved by early identi­fication and prevention of modifiable precipitating factors, routine (annual) reassessment of patients on transplant wait lists to identify worsening cardio­respiratory status, proper optimization of patients before transplant (eg, dialysis where indicated to reduce postoperative hyperkalemia), and judicious/­cautious administration of intravenous fluid intra­operatively and immediately postoperatively to reduce risk of pulmonary edema. A dedicated high dependency renal unit will care for patients requiring only cardiorespiratory monitoring. For the remaining fewer patients who will inevitably require ICU admission, mostly the later sepsis-related group, all efforts should be geared toward preventing multiple organ failure (a positive predictor of mortality) to improve outcome. Suthanthiran M, Stron TB. Renal transplantation. N Engl J Med .1994;331:365. Vella J, Brennan D. Patient Survival after Renal Transplantation. Topic 7347, Version 12.0. http://www.uptodate.com/store. December 2014. Mouloudi E, Massa E, Georgiadou E, et al. Course and outcome of renal transplant recipients admitted to the intensive care unit: a 20-year study. Transplant Proc. 2012;44(9):2718-2720. Klouche K, Amigues L, Massanet P, et al. Outcome of renal transplant recipients admitted to an intensive care unit: a 10-year cohort study. Transplantation. 2009;87(6):889-895. Mahony JF, Sheil AG. Long-term complications of cadaver renal transplantation. Transplant Rev (Orlando). 1987;1:47-58. Toussaint C, Kinnaert P, Vereerstraeten P. Late mortality and morbidity five to eighteen years after kidney transplantation. Transplantation. 1988;45(3):554-558. Baxter JD. Minimizing the side effects of glucocorticoid therapy. Adv Intern Med. 1990;35:173-193. Boitard C, Bach JF. Long-term complications of conventional immunosuppressive treatment. Adv Nephrol Necker Hosp. 1989;18:335-354. Chan GL, Canafax DM, Johnson CA. The therapeutic use of azathioprine in renal transplantation. Pharmacotherapy. 1987;7(5):165-177. Kahan BD, Flechner SM, Lorber MI, Golden D, Conley S, Van Buren CT. Complications of cyclosporine-prednisone immunosuppression in 402 renal allograft recipients exclusively followed at a single center for from one to five years. Transplantation. 1987;43(2):197-204. Puschett JB, Greenberg A, Holley J, McCauley J. The spectrum of ciclosporin nephrotoxicity. Am J Nephrol. 1990;10(4):296-309. Thistlethwaite JR, Jr., Stuart JK, Mayes JT, et al. Complications and monitoring of OKT3 therapy. Am J Kidney Dis. 1988;11(2):112-119. Sadaghdar H, Chelluri L, Bowles SA, Shapiro R. Outcome of renal transplant recipients in the ICU. Chest. 1995;107(5):1402-1405. Kogan A, Singer P, Cohen J, et al. Readmission to an intensive care unit following liver and kidney transplantation: a 50-month study. Transplant Proc. 1999;31(4):1892-1893. Radisic M, Lattes R, Chapman JF, et al. Risk factors for Pneumocystis carinii pneumonia in kidney transplant recipients: a case-control study. Transpl Infect Dis. 2003;5(2):84-93. Kirilov D, Cohen J, Shapiro M, Grozovski E, Singer P. The course and outcome of renal transplant recipients admitted to a general intensive care unit. Transplant Proc. 2003;35(2):606. Candan S, Pirat A, Varol G, Torgay A, Zeyneloglu P, Arslan G. Respiratory problems in renal transplant recipients admitted to intensive care during long-term follow-up. Transplant Proc. 2006;38(5):1354-1356. Abdulaziz A. The course and outcome of renal transplant recipients admitted to the intensive care unit at a tertiary hospital in Saudi Arabia. Saudi J Kidney Dis Transplant. 2007;18(4):536-540. Acknowledgements: The authors have no conflicts of interest to disclose and received no funding for this study.